The mission of the One Napa Valley Initiative (ONVI) Fund is to empower immigrants to feel more secure and engaged in the future of our community. Citizenship is correlated with higher family income, higher educational attainment for the children of immigrants that naturalize, higher proficiency in English, and more active engagement in community affairs. 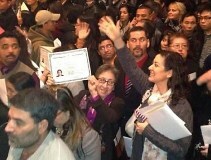 Today, there are nearly 9,000 Legal Permanent Residents in Napa County who are eligible to become citizens. 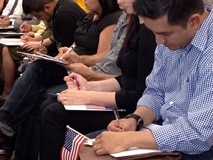 Our goal, working with our partners, is to help 2,000 of them apply for citizenship. By investing in naturalization services, we hope there will be other long-term, positive impacts for our Valley, including: less fear among immigrant households and greater willingness to fully engage in community life; more opportunities for Anglos and Latinos to establish more personal connections; and, active encouragement by local governments for immigrants to become more involved in civic affairs. Click here to watch our video and learn about some of Napa County’s newest citizens! ONVI is providing grants and technical assistance to a group of nonprofit agencies with expertise in legally-based immigration services, and trusted relationships with the largely Spanish-speaking immigrant community in Napa County. Our partner agencies are working together to: conduct outreach and education among immigrants on the benefits of citizenship; offer low-cost naturalization application assistance and related legal immigration services to eligible residents living or working Napa County; and, assist immigrants with citizenship interview and exam preparation, including civics and English-for-naturalization classes. In May 2012, Napa Valley Community Foundation released a study conducted by the nonpartisan Migration Policy Institute in Washington, DC, of the economic and fiscal impact of immigrants in Napa County . That study, the first-of-its kind for the region, underscored the substantial economic contributions made by immigrants in Napa Valley, and also pointed to a significant citizenship gap: many immigrants in Napa County are eligible to become citizens, but they haven’t done so nearly as frequently as their peers around the state.